Some specific event like a crash on the stock market happens more often when the angle between Mars and Uranus is in the range of 180-330 degrees. In other words, you will be able to consider specific market phenomena (turning points, up/down movements, a crash, etc.) in regards to specific astro phenomena (a planet's position, an angle between two planets, planetary speed, ingresses, midpoints, etc.) Please keep in mind that my purpose is not to claim that some of these statements are true or not true. I will show you only a possible way to consider these two sets of facts. You can do it easily with Timing Solution software. Let us start with the analysis of turning points. You should define only the minimum swing percentage; thus you define the degree of importance of identified turning points. It shows how many turning points can be identified by this zigzag: . Red stripes represent top turning points, while blue ones show bottom turning points. 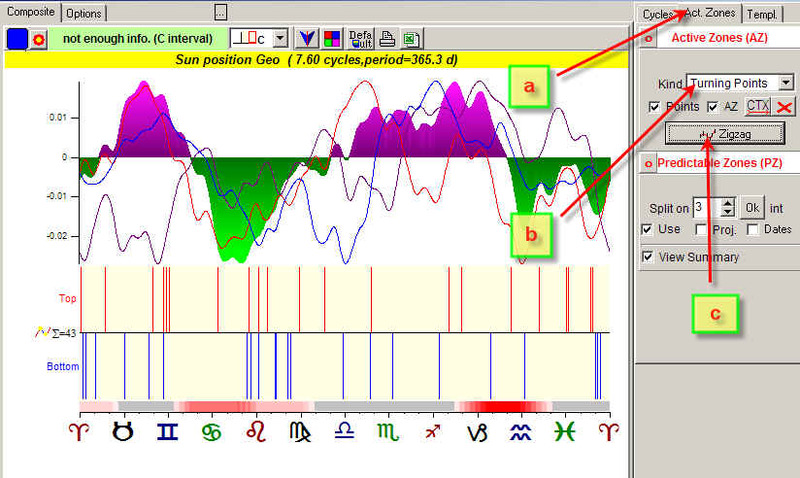 Thus you can easily see what Zodiacal positions are more typical for turning points. Here we have a small red cluster close to 180 degrees. It means that when the angle between the Moon and Neptune is close to the opposition (180 degrees), the top turning is more probable. Red stripes show when the stock market moves up at least 5%, blue ones are for a similar down movement. The picture above shows a cluster in September-November. It means that significant price movements are more typical in fall. There is one more possibility to research any phenomena in respect to the planetary angles. For example, let us research the major stock market crashes for the last 100 years. There we have to do a part of the job manually. Why "manually"? Just because the stock market crashes are not a big price drop down only, they are complex phenomena. So I would prefer to define these dates by hand. The dates format is mm/dd/yyyy. Keep these two strings as they are. As you see there is a cluster in the end of Libra - beginning of Scorpio. In this case red stripes will present positive values, blue -negative ones.